Regardless of individual opinions about global warming, running an energy efficient operation just makes good sense, and when that operation depends on the weather and nature, why abuse them? Toward that end, many ski resorts around the world have taken measures to become green. Following the Kyoto Convention and Al Gore’s 'An Inconvenient Truth', ski resorts are expanding their use of renewable energy. Currently twenty-two US ski resorts offset 100 percent of their power consumption by purchasing renewable energy. Serre Chevalier in France also relies on renewable sources for 25 percent of their power, exceeding the French national target of using 21 percent renewable energy by 2010. Forty-five American ski resorts use actual clean energy for at least some of their operations and sixteen others power their whole resorts with wind, hydroelectric, solar, biomass or geothermal energy. Laax, Switzerland generates power from local a hydroelectric station, as does Tux, Austria who utilizes glacial melt water to generate electricity. The Nevis Range in Scotland, generates most of their power locally with hydroelectric, and have a small test facility using a wind turbine. However, managing a green ski resort takes more than just using renewable energy. 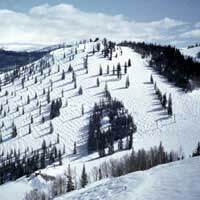 Aspen Skiing Company, which runs four resorts in Colorado, was awarded the 2006 Golden Eagle Award for Overall Environmental Excellence by a ski resort. All Aspen/Snowmass snowcats run on clean biodiesel and the company is the first in the ski industry to enact a green building policy, building Leadership in Energy and Environmental Design (LEED) certified and energy efficient structures. Almost half of Aspen/Snowmass employees contribute a dollar a week to the Environment Foundation, the total of which Aspen Community Foundation and the Aspen Skiing Company Family Fund matches. Local environmental clean air and water, trail maintenance and energy efficiency programs have received $1 million to date from the groups. In addition, ASC received the international third-party certification for environmental management - ISO 14001, which means ASC continually improves the management of its environmental impacts. Courchevel, Méribel and Belleville, France run their lift system entirely on renewable hydroelectric power. They also grow grass to reduce soil erosion; have installed low-energy street lighting; fitted office buildings with solar panels; installed organic toilets and hired snowboarders collect trash from the mountainside. Many Swiss resorts have been car free for decades, and American resorts like Breckenridge and Telluride built lifts from the town centers to alleviate the need to drive. Even Cairngorm, Scotland uses a tram that returns power to the grid. Alliance in the Alps, a network of almost 150 communities joined forces to realize the goals of the Alpine Convention, an international agreement for the protection of the natural habitat and for the promotion of sustainable development in the Alps. The members from Austria, France, Germany, Italy, Slovenia, Switzerland and Liechtenstein work in close contact with local residents to improve the ecological, social and economic situation in their communities and exchange their experiences and knowledge with the other members of the network. Even US ski resorts are getting together to support legislation for pollution limitations and increased use of clean renewable energy. Many organizations like the Ski Club of Great Britain, the (American) National Ski Area Association and the Dutch Ski Area Association rate ski resorts world wide on their greenness and award overachievers. The Ski Club of Great Brittan posts a guide to green resorts based on seven criteria. To be green, ski areas should target recycling 100% of waste and make it available to guests as well as run communal heating systems with the waste. Composting restaurant waste and using purified wastewater for snowmaking helps decrease water use and pollution. Utilizing green power and bio diesel to decrease air pollution and reducing traffic by banning cars altogether or by inhibiting driving and providing free convenient, preferably green powered, public transportation are two more steps resorts can take. The green guide also rates whether or not ski areas base all decisions on their environmental impact, build green, using helicopters, natural local building materials, maximum insulation and minimal power demands. The final step is to become ISO 14001 certified. The ISO 14001 family of standards, created in 1996 by the International Organization for Standardization, sets standards for companies to minimize their environmental impact and to continue to improve their environmental record. Jackson Hole, WY; Aspen, CO; Sun Peak, BC; and Zermatt, Switzerland are all certified. Arcalis, Andorra; Crans Montana, Switz. ; Soldue, Andorra; and Perisher Blue, Aus. are working towards the certification. The nature of destination resorts is environmentally unfriendly with visitors flying in on partially filled airplanes, and buying enormous inefficient second homes. Moreover, the ski industry’s dependence on real-estate growth negatively impacts wildlife habitat, water resources, and fossil fuel consumption. But, at least steps are finally being taken to protect our favorite playgrounds.